Not so long ago, Robin Hunicke played an instrumental role in making soothing, soulful PlayStation 3 hit Journey. Now she's heading up a new team and picking up where she left off: Luna is a game with no killing or amassing power, just human connection and learning from mistakes. 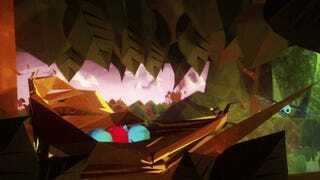 "Luna is a tactile puzzle game set in a vibrant and sculptural story-book world. It begins when the Owl convinces a young Bird to swallow the last piece of the waning moon." Crazy owls, always convincing impressionable young birds to eat moons. It's an epidemic, if you ask me. And while the surface level is an extremely important part of any game claiming to be "tactile," Hunicke hopes Luna will go much deeper than that. Transformation, living with mistakes and learning from them, is the main theme of the game, and Funomena aims to have that manifest in both puzzles and story. "It's a tactile puzzle game," Hunicke told me during in an interview at Indiecade in Culver City, CA. "It's narrative, but there will also be transformative puzzle games throughout the story. There's also gonna be a creative component that we can't say too much about right now because it's super early." Kinda vague, but Funomena's goals for the game are anything but. On no uncertain terms, they want to make a tale that doesn't hinge on how we usually confront our mistakes in video games—by murdering all involved and scorching every bit of earth they ever stepped on—but instead forces us to face them head-on. Stare them in the eye, try to look away because it's the most painful, awkward thing, but eventually look ahead again, clear-eyed and resolved. "One of the main things we're interested in exploring is in a lot of games if you make a mistake or are the victim of a mistake that's unfair, you get revenge," said Hunicke. "But that's not how it works in real life. Sometimes if you make a mistake, you have to live with it. You also have to process it and push through it and learn how to make it part of yourself." "One of the things we're interested in exploring in this fable—that comes up a lot in fairy tales and children's stories—is sometimes you make a mistake and then it turns into the rest of your life, in a way." For Hunicke especially, that type of story hits super close to home. In fact, if it hadn't happened to her, she probably wouldn't even be working in video games. "I was in graduate school for a long time before I started making games," she explained. "At some point I got very close to finishing my PHD, and then... I got lured away to the games industry. So you could say I decided to give up on something, but then it turned into something else. And then that thing ended up becoming this career filled with really wonderful people and lovely games and experiences I never would've had if I hadn't made the mistake of letting go of this project I'd spent so much time on. In a way it was the smartest thing I ever did, [even if it began as a mistake]." Hunicke went on to tell me that her whole team—and arguably most people—have experiences like that on their billowing life resumes, painful failings that led to future successes. Moments that defined them even if they felt like the end of the world at the time. She's encouraging everyone on the team to bring something personal to the equation, even Journey composer Austin Wintory, who's been crafting Luna's soundtrack since day one—rather than later in the process, as is the case with many games. Realistically coping with big life mistakes is a notion rarely explored in games, yet it is, in a lot of ways, universal. That's why, with Luna, Hunicke and co want to make something that will last—a fable that people of all ages, whether sprightly as a lightning bolt or aged and stooped as an older lightning bolt, can take something important away from. "When you read through fairytales and fables told in all cultures, these themes come up over and over again," she said. "The reason they come up over and over again is because we need to process how we fit into each environment we go into. We need to learn to trust, explore, and be safe—but at the same time be fearless. That's what you get from these really valuable and ancient stories in so many cultures. My goal with working on this game is to explore that space, to see how games can intersect with that lore or cultural knowledge that is so important to how we grow as a culture, as people in communities. Not just in the games community, but in communities we're in at large." But while the overarching idea of failure and growth applies to everyone, it's a process experienced on a very personal basis. That's why—despite telling a fairly linear, same-for-everybody story—Luna will be tactile with its puzzles and overall look. Hunicke and co hope to make a game that's physically personal, that you can reach out, touch, and mold. A claymation motif was the obvious answer. "There's a really strong desire on the team to make it feel like your fingerprints are all over the game when you get done playing it," Hunicke said. "One of the reasons we've engaged so much with this style of stop-animation and trying to make the world look so much like it's been shaped and sculpted and folded is that we really want you to feel that way when you finish as well." At the end of it all, Hunicke wants people to talk. From the very beginning Luna was conceived as part of a larger whole—a new fable, expressed as a video game—and she doesn't want the experience of it to exist in a vacuum. Rather, she sees this sort of story as an opportunity for to vault over the age gap and gets kids and adults talking on the same level. "It would be great if, at the end of Luna's production, it could be shared between a parent and a child," she said. "Read like a bedtime story or used as a creativity tool. Or it could be shared between two partners who want to have a conversation about growing up. I would love it if we could build something that's coded or readable by adults and kids—that could reach across the age and wisdom gap and create an exchange between people." Which is, of course, very different from the sort of talk other games sometimes engender in people, whether kids or adults. Trash talk and gentle ribbing have their place, but games sometimes lead to heated arguments, even harassment and toxicity. I asked Hunicke what she thought of that portion of games culture—if she felt like new kinds of games could, in the long run, help people empathize with each other better. "It's possible to moderate for positive feedback, to encourage people to do positive things instead of negative ones," she explained, referencing the fact that Journey, an inherently cooperative game, had to be redesigned many times before people stopped competing and trolling each other in it. "It's hard to do and it's difficult to think of the right answers, but if you're actively working on it eventually you will get there." "That's what we need to do. We need to work together to build a system that encourages alignment and positive change—not the status quo, not everything being the same or things being different in a positive way. I fundamentally believe that will make everyone happier. It will take all of us working together to solve it, but that's true of everything. It's true of global warming, it's true of poverty, it's true of social injustice. But if we all put our heads together I'm positive we can figure out a way to co-exist in a way that makes sense in any community." Life is too short for hate. And so, despite the fact that Luna is still amorphous and evolving—a clay blob only beginning to take shape—Hunicke wants that message to come across. She wants to use games to connect people. "It's a journey that we all go on. We all grow up, and then we all die," she said, half-laughing at the bluntness of the statement. "Talking about the beginning of that journey as opposed to the end is something I'm really excited about now."